Business Transformation: How Can You Get There? Over the past few years, organizations have experienced increasing challenges in the business environment. These range from uncertainty in the global economy, uncertainty in the credit markets, uncertainty in how new regulations will affect business, and challenges that are brought on by globalization, new technologies, and new trends such as mobility and social media. According to Gartner, the top ten strategic technology trends for 2013 are emerging amidst a nexus of converging forces – social, mobile, cloud and information. Although these forces are innovative and disruptive on their own, together they are revolutionizing business and society, disrupting old business models and giving new leaders an opportunity to emerge. In this scenario, businesses are forced to stay ahead of the competition by offering innovative products more quickly. They must offer outstanding customer service. They must achieve revenue goals, while also lowering the cost of doing business. They must be agile and flexible to respond to changing market needs, and make the best use of their people. They must also contend with the challenges of increased risk and regulations, and the need to provide real-time information. Other challenges include cultural trends, such as the use of social media data for new products and services, use of multiple devices by customers, partners and employees, etc. All of these challenges have a dramatic impact on organizations, which are continually looking for even better ways of doing business. The key themes that emerge from these challenges are that businesses must be more competitive in existing and new markets, must use new sources of information to be more innovative in their products and services, and must be more efficient in reducing costs and using their employees strategically. 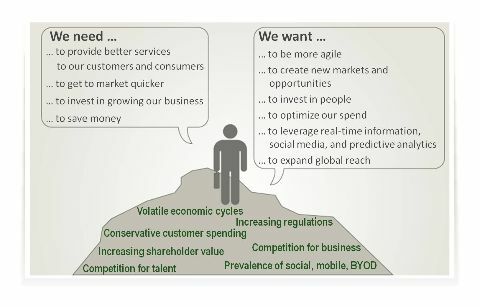 Organizations must develop new business capabilities to achieve these goals. To be successful, they need to leverage new technologies such as cloud computing, optimize their internal resources, and move to a new way of operating, with business outcomes in mind. This shift is not about technology alone, and requires a fundamental business transformation to acquire the new capabilities. In future blog posts, I’ll discuss these challenges and opportunities brought on by the move to Cloud and ITaaS in more detail. Interested in learning more about how to start the process? EMC’s new course, which will be available in early Q2, ”Cloud and IT as a Service for Business Transformation,” will show business leaders and their teams how to leverage cloud computing and IT as a Service to help drive innovation, agility, and efficiency. It discusses the framework required for the transformation, and provides the definitions, concepts, core elements, skills, and strategies to implement a services-centric organization. Also, if you will be attending EMC World, please come to my breakout session “Cloud Architect: Do You Have What it Takes to Lead the Transformation?” on Mon. May 6 at 2:30 pm, or Thurs. May 9 at 10:00 am. I look forward to seeing you there. Shankar is a Sr. Technical Education Consultant with EMC Education Services organization. He is responsible for designing, developing and delivering curriculum on the topics of cloud computing, IT as a Service (ITaaS), Platform as a Service (PaaS), DevOps, Automation and Orchestration, and related subjects. With over 18 years experience in leading global business and technology teams, Shankar has practical experience driving transformational change to ITaaS, most recently through his 5 years as part of EMC’s IT organization managing EMC’s cloud services/hosting portfolio. That experience, combined with 8 years managing the IT organization for RCN, provided Shankar with expertise and insight on IT strategy, systems integration, business process re-engineering and application lifecycle strategies for enterprise deployments. Shankar holds a Masters degree in Engineering from BITS Pilani, India, and an MBA from Babson College.